Thought I’d share a few pics of my current work space at my studio. It looks a little something like this. 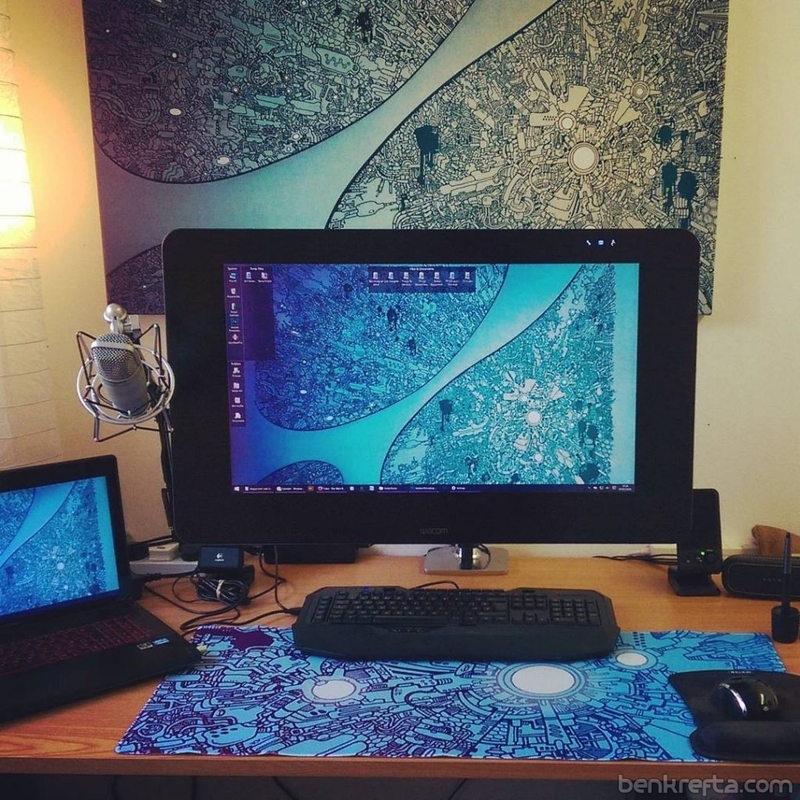 I’ve got my trusty Lenovo Laptop to the left, and a Wacom Cintiq graphics tablet to my right which is attached to a Ergotron arm- this means I can keep the Cintiq in a floating position for general surfing and writing, then re-position and tilt it down onto on the desk. 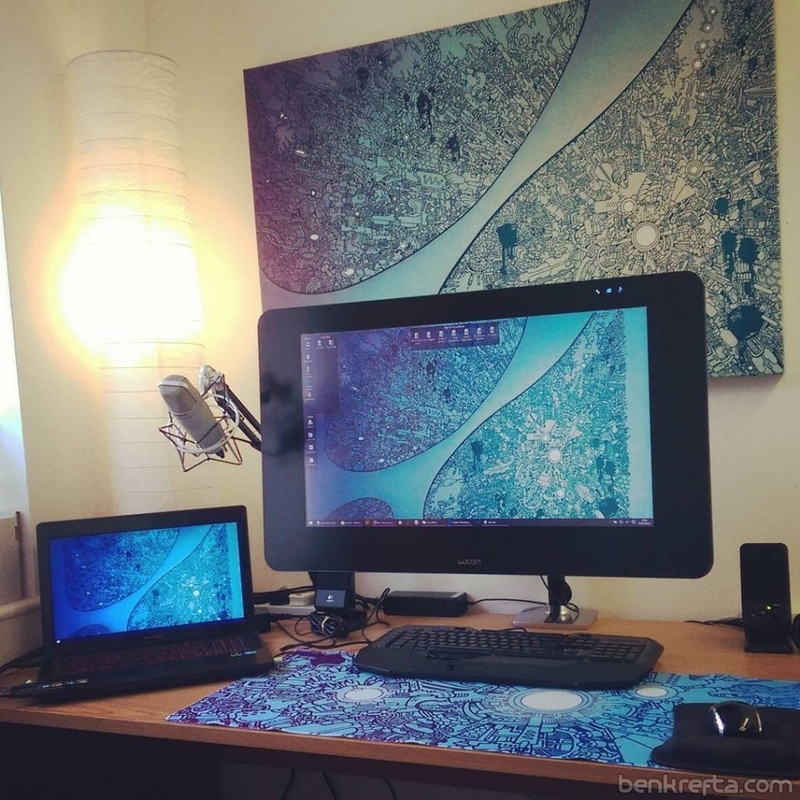 I have a custom large mouse mat for the desk to match the canvas I drew on the wall- the main reason is to stop the bottom of the tablet getting scratched or damaged on the desk when I push it in place. The black gel padded mouse mat supports my wrist. I use ‘Smudge guard 2’ when working on the tablet to prevent smear and reduce friction and often wear a pair of crystal Gunnar glasses which provide a small degree of eye relief when staring at the screen all day. My Laptop is now 4 years old, and I’d usually consider upgrading it after this amount of time, but I’m finding it hard to find something drastically better for an affordable price. Anyone use a Mac Book pro? I’ve seen a similar spec model to my current laptop, be it with a better resolution screen, but it’s 3 times the price. I couldn’t imagine the upgrade being worth it. I’ll no-doubt stick with what I have for a few more years to come then reassess my options. As much as I hate Microsoft, I’m familiar with Windows OS on a pretty deep level, so will likely stick with it also. And does anyone own an A3 size scanner? I’d like one but they are so expensive compared to A4. Other than that I’m pretty content with my current set up. Currently, I own a Macbook Pro, though it’s school given for study work. Anyways, in my opinion, if you plan on using them for anything other than storage or documents/art, then don’t buy them. A simple flash game can cause it to heat up excessively. What’s you budget for the upgrade as well? As that helps a lot. Thanks for the info. If I upgrade my laptop, I usually budget £600-£1000 ($800-$1300).